Eddie's candy shop blends the traditional and the contemporary. We carry many longtime Baltimore favorites, such as taffy, toffee, licorice, chocolate, gummies, brittle and jelly beans. But we always have an eye out for new treats for our customers. We proudly showcase locally produced confections, such as Naron Chocolates and A. Kirchmayr Chocolatier, as well as Salazon Organic Dark Chocolate Bars with Sea Salt and hand-cut Mouth Party Caramels. If you are looking for a simple dark chocolate bar, such as Lindt Excellence, or something more exotic, as in the flavored Vosges Chocolate Bars, we have them. 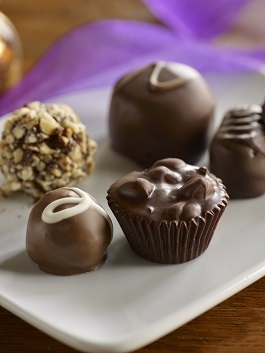 We can even hand-box your favorite selection of chocolates for you! With a large selection of bulk candy – Jelly Belly Jelly Beans, Gummi Bears, Swedish Fish and more – you can buy as little or as much as you want to satisfy those cravings. We even have marzipan and handmade toffee year-round, plus a large selection of sugar-free chocolates and hard candies. These prices are good until Apr 27, 2019.